Yes that's right, as well as being the company secretary, mum of 3, partner of Builder!, I am now registered to create websites just like this one. So if you like what you see drop me an email and i will see what i can do... Oui, cela est vrai, aussi bien comme étant le secrétaire de la société, maman de 3, partenaire du constructeur !, Je suis maintenant inscrit à créer des sites Web comme celui-ci. Donc, si vous aimez ce que vous voyez-moi un email et je vais voir ce que je peux faire. After leaving school I was employed as a secretary for 5 years. I then fancied a change and for the next 5 years worked as a "Signage Operative" creating sign's, identity cards, engraving plaques & badges and gaining a NVQ 2 (city & guilds) in digital printing also covering design. I then decided to make the move to France. 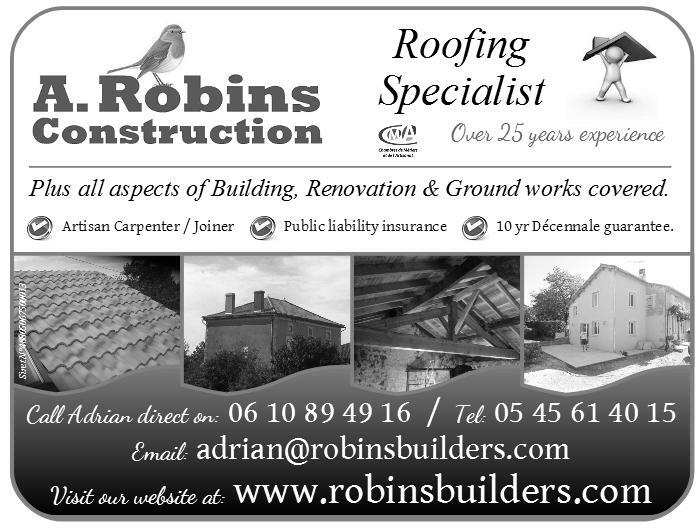 Since settling in the Charente in 2005 i have designed all of Adrian's Adverts, letter heads, business cards, vehicle signage & created his website. I have designed & submitted plans for barn conversions, which have all been passed. I have also designed menu's, flyers & business cards for various other clients & friends over the years.